Name Variation Catherine Mousseau was also known as Kathryn. Name Variation Catherine Mousseau was also known as Kate. Married Name 7 June 1938 As of 7 June 1938,her married name was Verberkmoes. Married Name before 2016 As of before 2016,her married name was Thomas. Catherine Mousseau was born circa 1916 at Wisconsin. She was the daughter of Joseph F. Mousseau and Mary Ann Walsh. Catherine Mousseau married James Francis Verberkmoes, son of Lester E. Verberkmoes and Mary L. Hayes, on 7 June 1938 at Loreto, Sauk, Wisconsin. Catherine Mousseau married (?) Thomas before 2016. 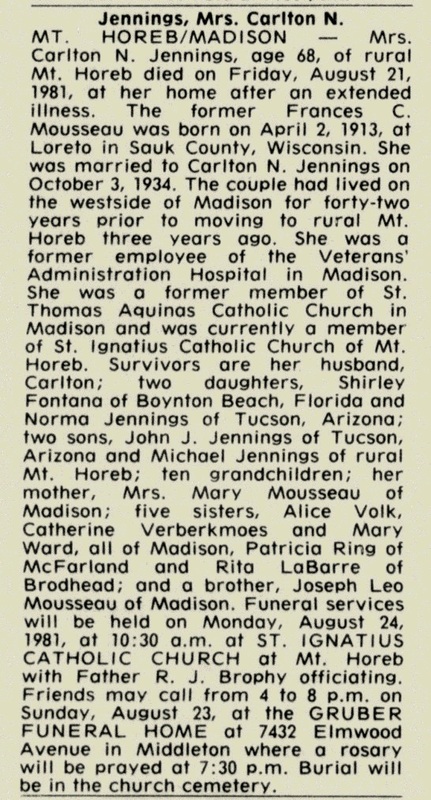 In August 1952 at Wisconsin Mr and Mrs J F Mousseau entertain three family birthdays including their daughter Kathryn Verberkmoes, and Mrs Mousseau's sister Mrs Ella Prouty. On 5 June 1988 at Monona, Wisconsin, James and Catherine (Mousseau) Verberkmoes 50th wedding anniversary celebration. [S243] U.S. Federal Census 1920 U.S. Federal Census, by Ancestry.com, ED160. Dwelling 97. [S250] U.S. Federal Census 1930 U.S. Federal Census, by Ancestry.com, ED56-8. Dwelling 168. Nickname James Francis Verberkmoes also went by the name of Bud. James Francis Verberkmoes was born on 29 June 1912 at Madison, Dane, Wisconsin. He was the son of Lester E. Verberkmoes and Mary L. Hayes. James Francis Verberkmoes married Catherine Mousseau, daughter of Joseph F. Mousseau and Mary Ann Walsh, on 7 June 1938 at Loreto, Sauk, Wisconsin. James Francis Verberkmoes died on 9 June 1992 at Dane, Wisconsin, at age 79 James Francis Verberkmoes obituary. James Francis Verberkmoes obtained US Social Security Card at Wisconsin; last residence not specified. On 5 June 1988 at Monona, Wisconsin, James and Catherine (Mousseau) Verberkmoes 50th wedding anniversary celebration. Married Name 3 October 1934 As of 3 October 1934,her married name was Jennings. Frances C. Mousseau was born on 2 April 1913 at Wisconsin. 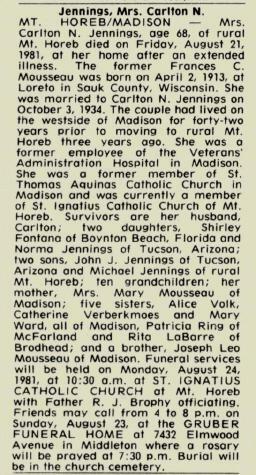 Frances C. Mousseau died on 21 August 1981 at Wisconsin at age 68 Mrs Carlton Jennings (Frances Mousseau) obituary. Married Name Her married name was Ward. Mary V. Mousseau married (?) Ward. Mary V. Mousseau was born circa 1921 at Wisconsin. (?) Ward married Mary V. Mousseau, daughter of Joseph F. Mousseau and Mary Ann Walsh. Married Name 21 June 1947 As of 21 June 1947,her married name was LaBarre. Rita A. Mousseau was born on 21 May 1923 at Plain, Sauk, Wisconsin. 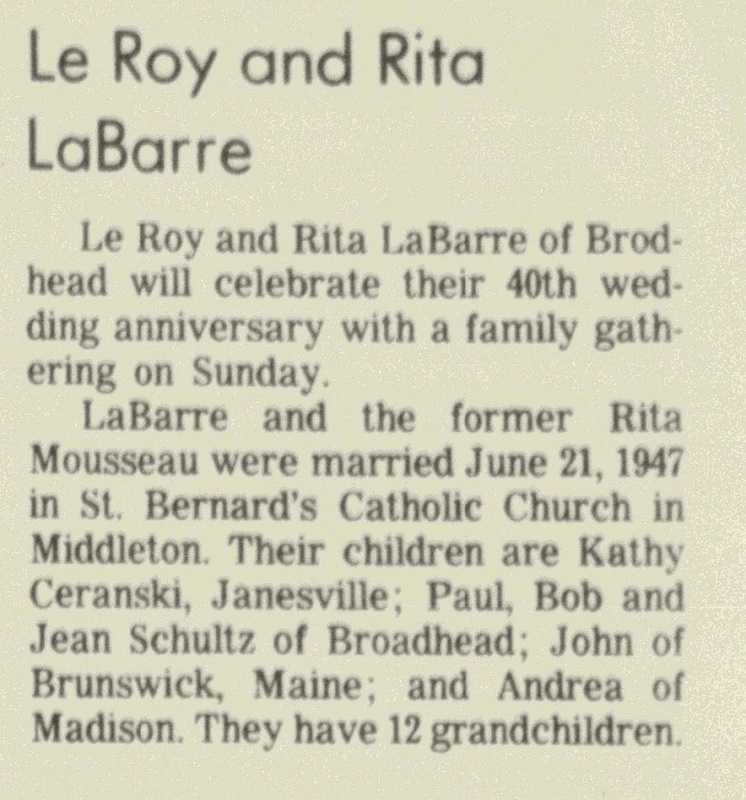 Rita A. Mousseau married LeRoy LaBarre on 21 June 1947 at Middleton, Wisconsin. Rita A. Mousseau died on 25 May 2014 at Green, Wisconsin, at age 91 Rita A. LaBarre, age 91 of Brodhead, passed away Sunday, May 25, 2014 at Monroe Clinic Hospital. She was born on May 21, 1923 in rural Plain, WI, the daughter of Joseph and Mary (Walsh) Mousseau. 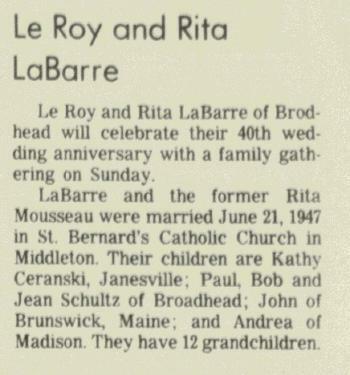 Rita married LeRoy LaBarre on June 21, 1947 at St. Bernards Catholic Church in Middleton. She graduated from Spring Green High School, Madison Business College and U.W. Madison extension with a Librarian certificate. She worked as a typesetter at the Independent Register in Brodhead for 17 years. 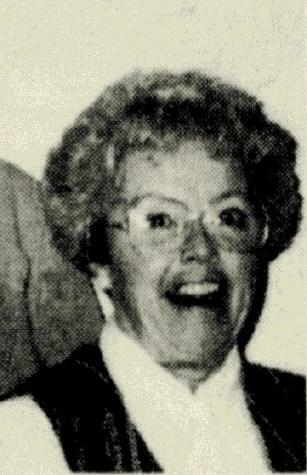 She was a member of St. Rose of Lima Catholic Church, Brodhead, Catholic Women's organization, past Secretary and President of St. Rose Catholic Women; past Secretary of Rock Deanery. Rita was an ardent supporter of Wisconsin Right to Life and Family Rosary. She enjoyed needlework, cross stitching, reading, walking, volunteering, a variety of music, and she enjoyed watching the butterflies. She is survived by 6 children; 19 grandchildren, 17 great-grandchildren; 3 sisters; brother-in-law; sister-in-law; many nieces, nephews, other relatives and friends. She was preceded in death by her parents, husband, sisters, Alice Volk and Frances Jennings; a brother Joseph Mousseau. Everson Funeral Home, Brodhead. In June 1987 LeRoy and Rita (Mousseau) LaBarre 40th wedding anniversary celebration. LeRoy LaBarre was born on 17 October 1924 at Minnesota. He married Rita A. Mousseau, daughter of Joseph F. Mousseau and Mary Ann Walsh, on 21 June 1947 at Middleton, Wisconsin. LeRoy LaBarre died on 6 June 2004 at age 79 LeRoy "Bud" LaBarre, age 79, of Brodhead, passed away on Sunday, June 6, 2004, at his home, with his family. He was born on Oct. 17, 1924, in Virginia, Minn., the son of Andrew and Olivia (Iverson) LaBarre. He married Rita Mousseau on June 21, 1947, at St. Bernard's Catholic Church, Middleton. LeRoy enlisted in the U.S. Army in 1943 and served from 1943 until 1945 as a staff sergeant-rifle squad leader in the Blackhawk 86th Infantry Division. Bud was wounded in Germany and was awarded the Purple Heart and the Bronze Star, highlighting his distinguished military service. After being honorably discharged, Bud worked for General Telephone Company. Later, he became a partner and then VP of J.D. Kratz Company, Footville, until 1982 when he retired and took up his passion with small aircraft and building his own Hatz Bi-plane. He is survived by his wife, Rita; six children, Kathy LaBarre, Janesville, Paul (Laurie) LaBarre, Bob LaBarre and Jean (Fritz) Schultz, all of Brodhead, John (Linda) LaBarre, Cincinnati, Ohio, and Andrea (David) White, Albuquerque, N.M; five brothers, Kenneth (Ruth) Hanson, Posen, Ill., Jack (Sandy) LaBarre, Mount Iron, Minn., Arthur and Albert Disrud, South Beloit, Ill., and Raymond (Louise) LaBarre, Ala., a sister, Lucille Wood, South Beloit, Ill; 19 grandchildren; and four great-grandchildren. He was preceded in death by his parents; and a brother, Carl Disrud. A Mass of Christian Burial will he be held at 11 a.m. on Thursday, June 10, 2004, at ST. ROSE OF LIMA CATHOLIC CHURCH, Brodhead, with Father Donn Heiar presiding. Burial will be in Greenwood Cemetery, Brodhead, with military services. 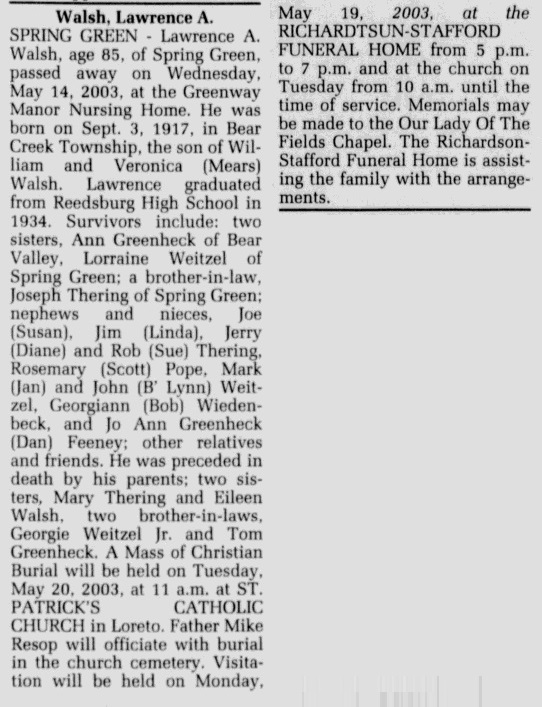 Visitation will be held from 4 p.m. until 7 p.m. on Wednesday, June 9, 2004, at the NEWCOMER FUNERAL HOME, Brodhead. Married Name 13 December 1958 As of 13 December 1958,her married name was Ring. Patricia A. Mousseau was born on 29 April 1929 at Wisconsin. Patricia A. Mousseau married Donald Ring on 13 December 1958. Patricia A. Mousseau died on 9 November 2016 at age 87 Patricia A. Ring, age 87, passed away peacefully, on Wednesday, Nov. 9, 2016. She was born on April 29, 1929, to Joseph and Mary (Walsh) Mousseau. Pat graduated from Madison West High School with the class of 1948. She was united in marriage to Donald Ring on Dec. 13, 1958. Pat loved to attend Don's shows when he played in the band. She worked for the University Hospital, IBM and retired from Ohmeda. 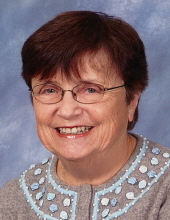 Pat was an active member of Christ the King Catholic Church and the Madison Jazz Society. She enjoyed attending the Madison Symphony, the Fireside and musicals with her friend and companion, Ray Van Kylen. Pat is survived by her daughter, Stephanie Brassington; grandson, Mark Brassington; granddaughter, Jennifer Brassington; seven great- grandchildren; sisters, Catherine Thomas and Mary Ward; and many loving relatives and friends. She was preceded in death by her parents; husband, Donald; son, Steven; three sisters; and one brother. A Mass of Christian Burial will be held at CHRIST THE KING CATHOLIC CHURCH, 5306 Main Street, McFarland, at 11 a.m., on Monday, Nov. 14, 2016, with Father D. Steven Smith presiding. Burial will follow at Roselawn Memorial Park. Visitation will be held on Monday from 9 a.m. until the time of the Mass. In lieu of flowers, memorials may be made to the family for a fund to be established. Name Variation Donald Ring was also known as Don. Donald Ring married Patricia A. Mousseau, daughter of Joseph F. Mousseau and Mary Ann Walsh, on 13 December 1958. Donald Ring died before 2016. Name Variation Joseph Leo Mousseau was also known as Leo Joseph. Joseph Leo Mousseau was born on 6 July 1927 at Wisconsin. 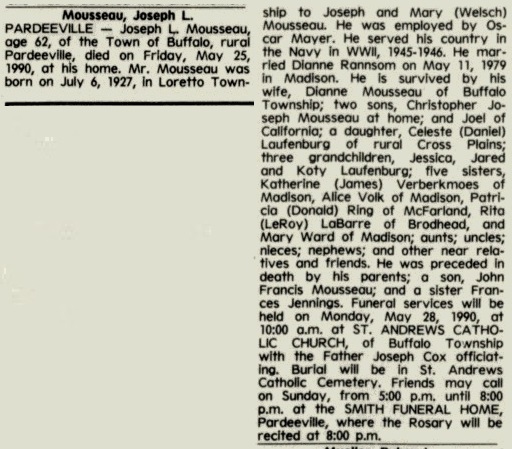 He was the son of Joseph F. Mousseau and Mary Ann Walsh. Joseph Leo Mousseau died on 25 May 1990 at Wisconsin at age 62 Joseph Leo Mousseau obituary. Joseph Leo Mousseau obtained US Social Security Card at Wisconsin; last residence not specified. John Mousseau was born on 30 March 1955. He was the son of Joseph Leo Mousseau. John Mousseau died in July 1980 at Cross Plains at age 25. Married Name 29 November 1916 As of 29 November 1916,her married name was Walsh. Veronica Ann Mears was born on 19 June 1897 at Wisconsin. She was the daughter of James Mears and Catherine (?). Veronica Ann Mears married William J. Walsh, son of Michael J. Walsh and Mary Kaney, on 29 November 1916 at Sauk, Wisconsin, #13-152. 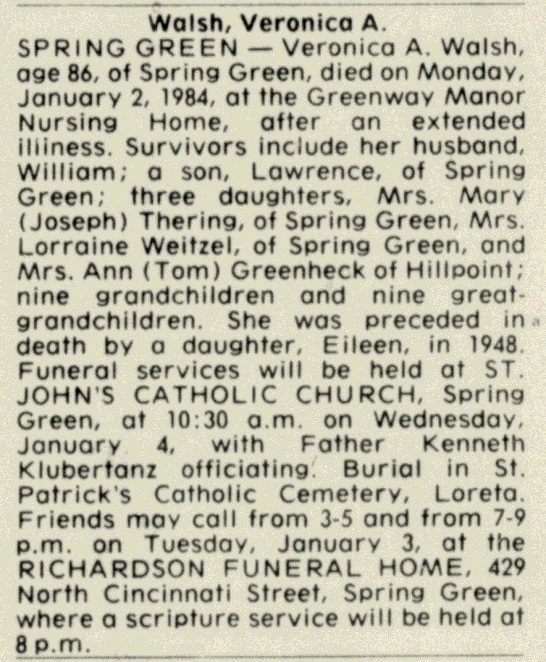 Veronica Ann Mears died on 2 January 1984 at Sauk, Wisconsin, at age 86 Veronica (Mears) Walsh obituary. Veronica Ann Mears obtained US Social Security Card at Wisconsin; last residence Spring Green, Sauk, Wisconsin. [S180] Wisconsin Sauk Co Cemetery Records Vol 6, page 14. [S245] U.S. Federal Census 1900 U.S. Federal Census, by Ancestry.com, Ed 129. Dwelling 55. Sheet 3B. [S244] U.S. Federal Census 1910 U.S. Federal Census, by Ancestry.com, ED 110. Sheet 7B. Dwelling 125. [S243] U.S. Federal Census 1920 U.S. Federal Census, by Ancestry.com, ED160. Dwelling 96. [S250] U.S. Federal Census 1930 U.S. Federal Census, by Ancestry.com, ED56-8. Dwelling 133. 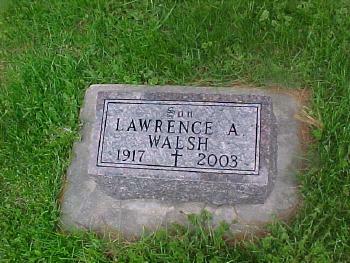 Lawrence A. Walsh was never married. He was born on 3 September 1917 at Bear Creek, Sauk, Wisconsin. 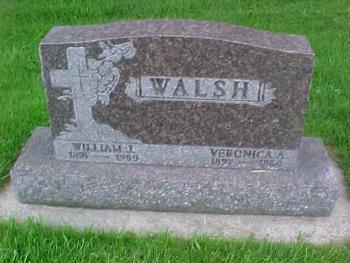 He was the son of William J. Walsh and Veronica Ann Mears. 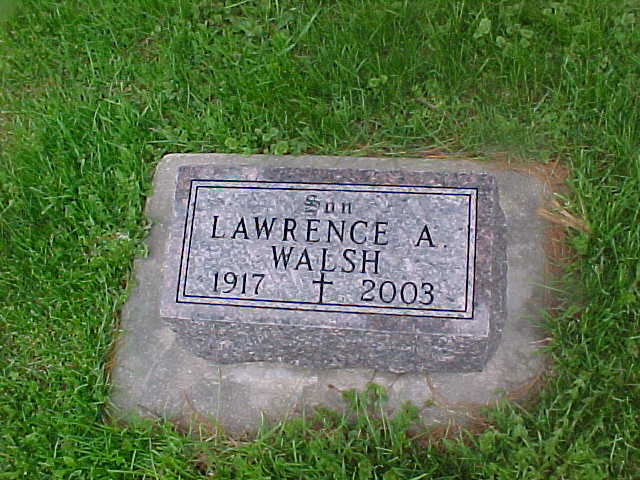 Lawrence A. Walsh died on 14 May 2003 at age 85 Lawrence A. Walsh, age 85, of Spring Green, passed away on Wednesday, May 14, 2003, at the Greenway Manor Nursing Home. 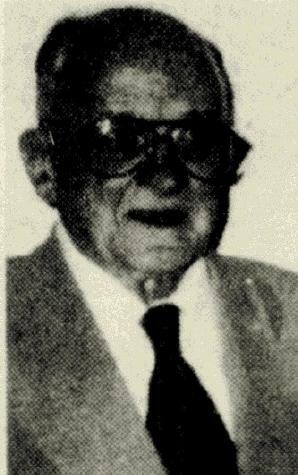 He was born on Sept. 3, 1917, in Bear Greek Township, the son of William and Veronica (Mears) Walsh. 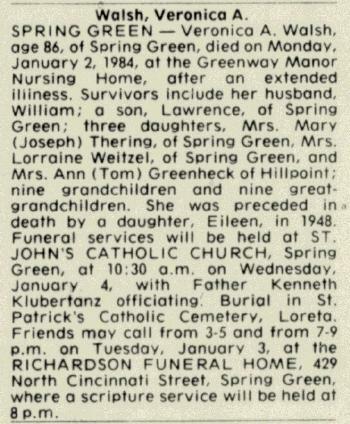 He was preceded in death by his parents; two sisters, Mary Thering and Eileen Walsh; two brother-in-laws, Georgie Weitzel Jr. and Tom Greenheck. 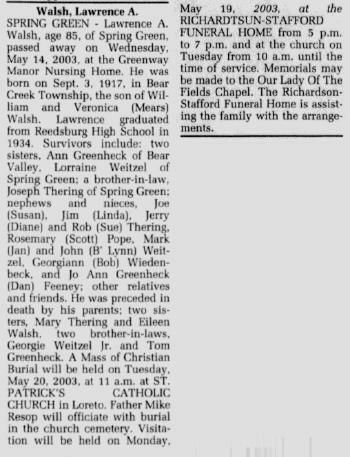 He was buried after 14 May 2003 at St. Patrick's Catholic Cemetery; New Loreto, Bear Creek, Sauk, Wisconsin. Name Variation Mary Catherine Walsh was also known as Mary Katherine. Married Name 23 June 1943 As of 23 June 1943,her married name was Thering. Mary Catherine Walsh was born on 30 June 1920 at Wisconsin. She was the daughter of William J. Walsh and Veronica Ann Mears. Mary Catherine Walsh married Joseph John Thering, son of Joseph Leo Thering and Rose V. Ederer, on 23 June 1943. 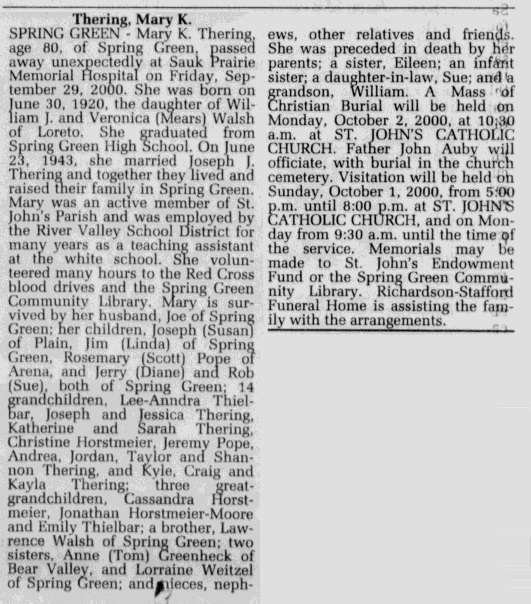 Mary Catherine Walsh died on 29 September 2000 at Wisconsin at age 80 Mary (Walsh) Thering obituary. Mary Catherine Walsh obtained US Social Security Card at Wisconsin; last residence Spring Green, Sauk, Wisconsin. Joseph John Thering was born on 20 October 1917 at Wisconsin. He was the son of Joseph Leo Thering and Rose V. Ederer. 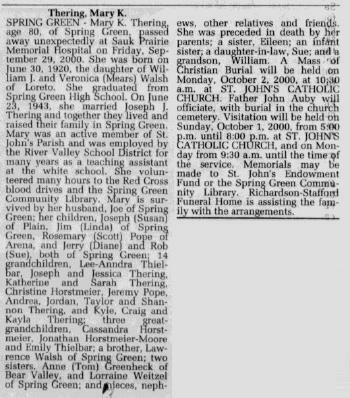 Joseph John Thering married Mary Catherine Walsh, daughter of William J. Walsh and Veronica Ann Mears, on 23 June 1943. Joseph John Thering died on 3 August 2004 at age 86. [S243] U.S. Federal Census 1920 U.S. Federal Census, by Ancestry.com, Year: 1920;Census Place: Spring Green, Sauk, Wisconsin; Roll: T625_2015; Page: 1A; Enumeration District: 178; Image: 448. [S250] U.S. Federal Census 1930 U.S. Federal Census, by Ancestry.com, Year: 1930; Census Place: Wyoming, Iowa, Wisconsin; Roll: 2573; Page: 1B; Enumeration District: 28; Image: 1058.0. Married Name 1944 As of 1944,her married name was Weitzel. Lorraine Walsh was born on 8 September 1921 at Wisconsin. Lorraine Walsh married George W. Weitzel Jr., son of George Albert Weitzel and Florence M. Dwyer, in 1944. Lorraine Walsh died on 8 May 2018 at age 96 Lorraine E. Weitzel age 96 of Spring Green passed away on Tuesday, May 8, 2018 at the Greenway Manor Nursing Home in Spring Green. She was born on September 8, 1921 on Loreto Ridge the daughter of William and Veronica (Mears) Walsh. She was married in 1944 to George W. Weitzel Jr. Survivors include her 3 children, John (B’Lynn) Weitzel of Rockton, IL, Mark Weitzel of Madison, Georgia Weitzel and Carl of Lodi, 4 grandchildren, 3 great grandchildren, a sister, Ann Greenheck of Bear Valley, a sister-in-law, Mary Florence Weitzel of Reedsburg, nieces, nephews, other relatives and friends. 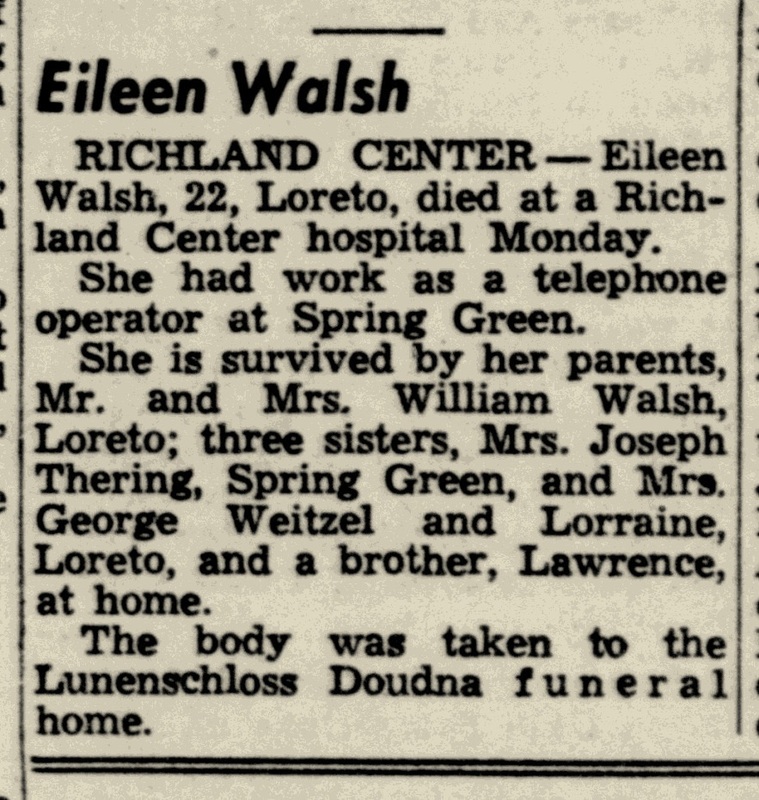 She was preceded in death by her parents, William and Veronica Walsh, her husband, George W. Weitzel Jr., a brother, Lawrence Walsh, 2 sisters, Eileen Walsh and Mary Thering. A private family Mass in memory of Lorraine will be held at St. Patrick’s Catholic Church on Loreto Ridge with burial in the church cemetery. Online condolences available at www.staffordfuneralhomes.com. The Richardson-Stafford Funeral Home in Spring Green is assisting the family with the arrangements. [S373] U.S. Federal Census 1940 U.S. Federal Census, by Ancestry.com, Year: 1940; Census Place: Madison, Dane, Wisconsin; Roll: T627_4469; Page: 7B; Enumeration District: 13-52. Name Variation George W. Weitzel Jr. was also known as Georgie. George W. Weitzel Jr. was born on 19 May 1912 at Wisconsin. He was the son of George Albert Weitzel and Florence M. Dwyer. George W. Weitzel Jr. married Lorraine Walsh, daughter of William J. Walsh and Veronica Ann Mears, in 1944. George W. Weitzel Jr. died on 25 October 1969 at Richland Center, Richland, Wisconsin, at age 57. [S243] U.S. Federal Census 1920 U.S. Federal Census, by Ancestry.com, ED160. Dwelling 56. 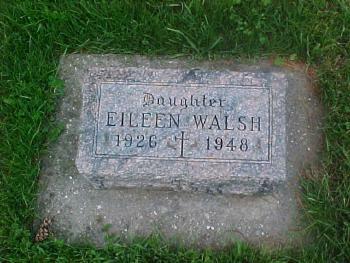 Eileen Walsh was born in 1926 at Wisconsin. 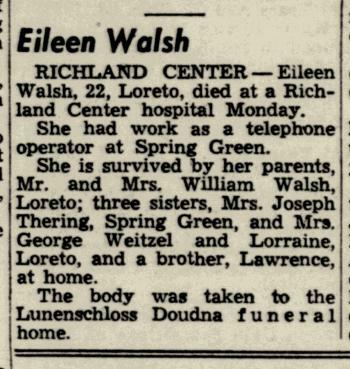 Eileen Walsh died in December 1948 at hospital, Richland Center, Richland, Wisconsin, Eileen Walsh obituary. 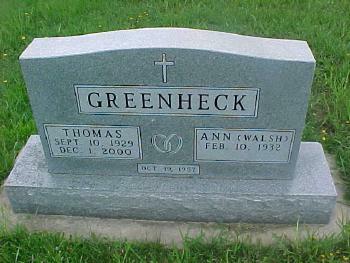 Name Variation John Thomas Greenheck was also known as Tom. 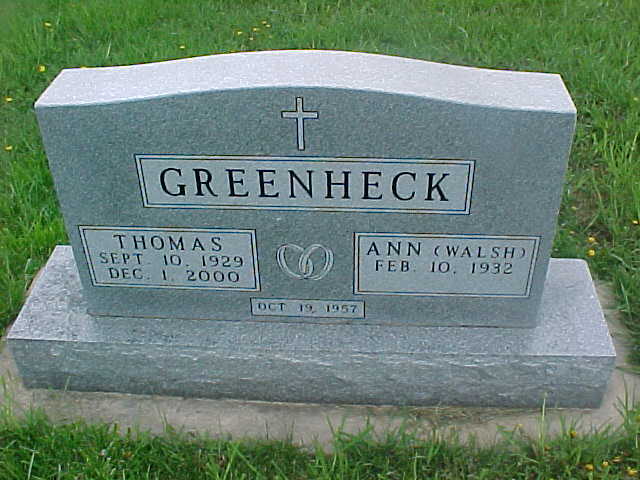 Name Variation John Thomas Greenheck was also known as Thomas. John Thomas Greenheck was born on 10 September 1929 at Wisconsin. He was the son of John Joseph Greenheck and Agnes Catherine Roessler. John Thomas Greenheck died on 1 December 2000 at Madison, Dane, Wisconsin, at age 71 Thomas Greenheck obituary. He was buried after 1 December 2000 at St Patrick Loretto Cemetery, Bear Creek, Sauk, Wisconsin. [S250] U.S. Federal Census 1930 U.S. Federal Census, by Ancestry.com, ED52-9. Dwelling 175. Name Variation William J. Prouty was also known as Bill. William J. Prouty was born on 19 May 1924 at Richland Center, Richland, Wisconsin. He was the son of Walter Lorence Prouty and Ella Margaret Walsh. William J. Prouty married Elizabeth Joyce circa 1950. William J. Prouty died on 4 February 2007 at Florida at age 82 William J Prouty obituary. [S250] U.S. Federal Census 1930 U.S. Federal Census, by Ancestry.com, ED52-17. Dwelling 214. Name Variation John Charlson was also known as Joe. Name Variation John Charlson was also known as Johan. Name Variation John Charlson was also known as Karlsen. John Charlson was born on 4 December 1881 at Norway. He was the son of Karl Johan Martinussen and Margaret Lykken. John Charlson married Hilda Wevik, daughter of Ole Olsen Wevik and Lizzie Solem, on 17 December 1908 at Alcester, Union, South Dakota, also reported as 17 Dec 1908. John Charlson died on 4 February 1936 at age 54. He was buried after 4 February 1936 at Union Cemetery, Remson, Plymouth, Iowa. 1 January 1925 Sioux City, Woodbury, Iowa He appeared on the census of 1 January 1925 at Sioux City, Woodbury, Iowa. John Charlson immigrated in 1908 also reported as 1898. [S244] U.S. Federal Census 1910 U.S. Federal Census, by Ancestry.com, ED113. Dwelling 21. [S243] U.S. Federal Census 1920 U.S. Federal Census, by Ancestry.com, ED64. Sheet 13B. Dwelling 83. [S250] U.S. Federal Census 1930 U.S. Federal Census, by Ancestry.com, ED67-11. Dwelling 78. Name Variation Marvid Clarence Charlson was also known as Marvin Clarence. Marvid Clarence Charlson was born on 10 August 1909 at Alcester, Union, South Dakota. He was the son of John Charlson and Hilda Wevik. Marvid Clarence Charlson died on 13 August 1969 at age 60. 1 January 1925 Sioux City, Woodbury, Iowa Marvid Clarence Charlson appeared on the census of 1 January 1925 in the household of John Charlson at Sioux City, Woodbury, Iowa. Marvid Clarence Charlson obtained US Social Security Card at Iowa; last residence Tularosa, Otero, New Mexico. Name Variation Elmer Oliver Charlson was also known as Almer. Elmer Oliver Charlson was born on 10 April 1911 at Hamill, Tripp, South Dakota. Elmer Oliver Charlson died on 2 February 1987 at Sioux Falls, South Dakota, at age 75. 1 January 1925 Sioux City, Woodbury, Iowa Elmer Oliver Charlson appeared on the census of 1 January 1925 in the household of John Charlson at Sioux City, Woodbury, Iowa. Elmer Oliver Charlson obtained US Social Security Card at Iowa; Last residence Sioux Falls, Minnehaha, South Dakota..
Name Variation Herman Jerome Charlson was also known as Ole. Herman Jerome Charlson was born on 9 May 1912 at Alcester, Union, South Dakota. Herman Jerome Charlson died on 4 February 1951 at age 38. 1 January 1925 Sioux City, Woodbury, Iowa Herman Jerome Charlson appeared on the census of 1 January 1925 in the household of John Charlson at Sioux City, Woodbury, Iowa. [S250] U.S. Federal Census 1930 U.S. Federal Census, by Ancestry.com, ED6. Dwelling 305. Ernest L. Charlson was born on 16 October 1913 at Alcester, Union, South Dakota. Ernest L. Charlson died on 24 May 1968 at LeMars, Iowa, at age 54. 1 January 1925 Sioux City, Woodbury, Iowa Ernest L. Charlson appeared on the census of 1 January 1925 in the household of John Charlson at Sioux City, Woodbury, Iowa. Ernest L. Charlson obtained US Social Security Card at Iowa; Last residence Le Mars, Plymouth, Iowa.. He attended the 13th annual Lykken family reunion Emil Fred Klemme and Anna Marie Lykken were The 13th annual Lykken reunion was held Sunday, August 17, at the home of Mr. And Mrs. Emil Klemme at Akron. Name Variation Eugene Charles Victor Charlson was also known as Gene. Nickname Eugene Charles Victor Charlson also went by the name of Swede. Eugene Charles Victor Charlson was born on 9 November 1920 at Alcester, Union, South Dakota. Eugene Charles Victor Charlson married Katherine Elizabeth McGuire before 1948 From Lynton (Bill) Stewart: My wife's parents were never legally married, although they went through a marriage ceremony in Georgia. He listed his "wife" as a dependent during his service in the U.S. Army, and my wife was born at the Post Hospital at Fort McPherson in Atlanta, GA. Gene Charlson and Katherine Elizabeth McGuire Burke had two daughters born of their relationship. Both of them were married to other people at the time of their "marriage" in Georgia. We do not know if he fathered any other children. Eugene Charles Victor Charlson married Frances Pierce Ford in December 1964. 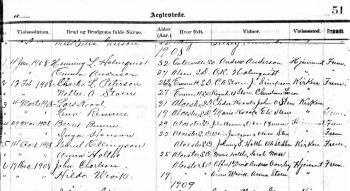 1 January 1925 Sioux City, Woodbury, Iowa Eugene Charles Victor Charlson appeared on the census of 1 January 1925 in the household of John Charlson at Sioux City, Woodbury, Iowa. Eugene Charles Victor Charlson obtained US Social Security Card at Iowa; Last residence Beaverton, Washington, Oregon.. On 14 December 1942 at U.S. World War II Army Enlistment, Los Angeles, California, Name: Eugene C Charlson Birth Year: 1920 Race: White, citizen (White) Nativity State or Country: South Dakota State: California County or City: San Bernardino Enlistment Date: 14 Dec 1942 Enlistment State: California Enlistment City: Los Angeles Branch: Branch Immaterial - Warrant Officers, USA Branch Code: Branch Immaterial - Warrant Officers, USA Grade: Private Grade Code: Private Term of Enlistment: Enlistment for the duration of the War or other emergency, plus six months, subject to the discretion of the President or otherwise according to law Component: Selectees (Enlisted Men) Source: Civil Life Education: 4 years of high school Marital Status: Single, with dependents Height: 74 Weight: 068. On 30 October 1946 He enlisted in the Army again on 30 October 1946 at Boca Raton Army Air Field in Florida. He enlisted for 3 years. He was medically discharged from the Army/Navy Hospital in Hot Springs, Arkansas on 26 Nov 1948. In December 1948 Believed to have embezzled money from his employer in San Francisco in December of 1948, and Katherine hocked her jewelry to bail him out of jail. He then disappeared, and she never heard from him again. [S272] Oregon Death Index, 1903-98 (published), Certificate: 87-00853. Name Variation John Raymond Charlson was also known as Raymond. John Raymond Charlson was born on 30 November 1926 at Hornick, Woodbury, Iowa. John Raymond Charlson died on 22 April 1984 at LeMars, Iowa, at age 57. John Raymond Charlson obtained US Social Security Card at Iowa; Last residence Le Mars, Plymouth, Iowa..
Name Variation Katherine Elizabeth McGuire was also known as Kitty. Name Variation Katherine Elizabeth McGuire was also known as Catherine Elizabeth. Married Name May 1936 As of May 1936,her married name was Burke. Married Name before 1948 As of before 1948,her married name was Charlson. Katherine Elizabeth McGuire was born on 19 March 1917. She married Eugene Charles Victor Charlson, son of John Charlson and Hilda Wevik, before 1948 From Lynton (Bill) Stewart: My wife's parents were never legally married, although they went through a marriage ceremony in Georgia. He listed his "wife" as a dependent during his service in the U.S. Army, and my wife was born at the Post Hospital at Fort McPherson in Atlanta, GA. Gene Charlson and Katherine Elizabeth McGuire Burke had two daughters born of their relationship. Both of them were married to other people at the time of their "marriage" in Georgia. We do not know if he fathered any other children. Katherine Elizabeth McGuire died on 30 January 2005 at age 87. Married Name 17 May 1948 As of 17 May 1948,her married name was Rezek. Helen Leola Charlson was born on 15 December 1917 at Alcester, Union, South Dakota. She was the daughter of John Charlson and Hilda Wevik. Helen Leola Charlson married Rudie R. Rezek, son of Joseph Rezek and Anna (? ), on 17 May 1948 second marriage. Helen Leola Charlson died on 8 July 2008 at age 90 Helen L. Rezek, 90, of Wahoo died Tuesday, July 8, 2008, at Saunders County Care Center in Wahoo. She was born Dec. 15, 1917, in Beresford, S.D., to John and Hilda (Wievik) Charlson. She grew up and attended school in the Beresford area. She later worked for a doctor while living in Sioux City, Iowa. She moved to Lincoln and worked at Western Electric. She married Rudie Rezek on May 17, 1948. They moved to Wahoo. She worked at Campbell Soup Co. in Fremont for five years. She then helped to set up and run the kitchen at Haven House when it first opened. Later, she became the cafeteria manager at Bishop Neumann High School. She worked there for 17 1/2 years. She was a member of St. Wenceslaus Catholic Church, St. Ludmilla?s Guild, Altar Rosary Society and Veterans of Foreign Wars Auxiliary Post 4502. Survivors include: two sons, Bob (and wife, Mitzi) Ward of Phoenix and Don (and wife, Sandy) Ward of Crete; a daughter, Pam (and husband, Lyle) Knox of Omaha; eight grandchildren, 20 great-grandchildren and a great-great-grandchild. She was preceded in death by her husband, infant twins and six brothers. The funeral will be 10 a.m. Saturday at St. Wenceslaus Catholic Church in Wahoo with the Rev. Charles Townsend officiating. Visitation will be from 4-8:30 p.m. Friday at Svoboda Funeral Home in Wahoo. An Altar Rosary Society rosary will be said at 5 p.m. Friday with a parish rosary at 7:30 p.m., both at the funeral home. Visitation will continue one hour prior to service time Saturday at the church. Burial will be in St. Francis Cemetery. Memorials have been established to St. Wenceslaus Church and VFW Auxiliary Post 4502. 1 January 1925 Sioux City, Woodbury, Iowa Helen Leola Charlson appeared on the census of 1 January 1925 in the household of John Charlson at Sioux City, Woodbury, Iowa. Helen Leola Charlson obtained US Social Security Card at Nebraska; last residence Wahoo, Saunders, Nebraska. Name Variation Anders Olai Solem was also known as Olson. Name Variation Anders Olai Solem was also known as Andrew. Anders Olai Solem was born in March 1850 at Norway also reported as 1852. He was the son of Ole Mathias Andersen Stubhaug and Danille Ingvaldsdtr Solem. 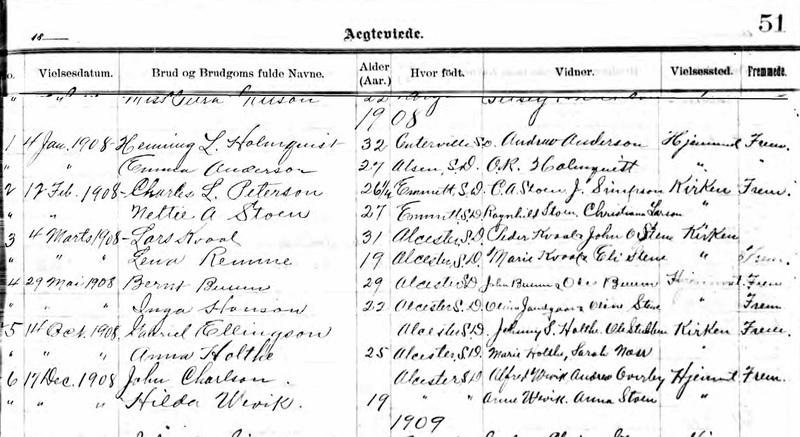 Anders Olai Solem married Sigri Johnson Lund, daughter of John Gunnarsen Lund and Gertrude Thoresdatter Kleven, on 26 March 1877. 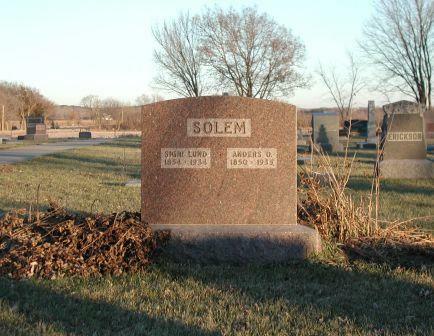 Anders Olai Solem died on 24 January 1935 at Union, South Dakota, at age 84 also reported as 1933. He was buried after 24 January 1935 at South St. Paul Cemetery, Union, South Dakota, Grave 3, Lot 25, Block 2, Section 2; also reported as 1933. Anders Olai Solem immigrated with Ole Mathias Andersen Stubhaug and Gunhild Pernille Madsdatter Hafstad in 1866 at Michigan. Anders Olai Solem and Sigri Johnson Lund were naturalized in 1880.